You can convert the artwork on an art layer to match its new layer type. You can also vectorize your bitmap artwork to work in a vector layer. In the Timeline view, select the layer that contains the drawings you want to convert. From the Timeline view menu, select Layers > Convert Drawings to Match Art Layer Type. 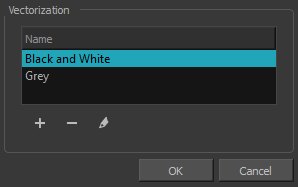 You can also right-click on the selected layer and select Convert Drawings to Match Art Layer Type. All drawings in the layer are converted to the selected art mode. Note that bitmap strokes are not vectorized when converted to a vector art layer. They are simply inserted in a square vector frame containing a bitmap texture. In the Timeline view, add a vector drawing layer BELOW the bitmap drawing layer containing the drawing to vectorize. 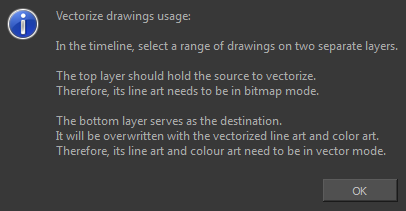 In your bitmap drawing, the artwork to vectorize must be placed on the Line Art layer (default drawing layer). If you place the vector drawing on top of the bitmap layer, you will not be able to perform the operation. A warning dialog box will display. On the right side of the Timeline view, select the bitmap drawing and corresponding cell in the vector drawing layer. Right-click and select Drawings > Vectorize Line Art in Selected Drawing. The Convert to Vector Drawing dialog box opens. In the Vectorization section, select a vectorization preset. You can customize your own preset using the Add or Edit buttons—see About Custom Vectorization Parameters . Your vectorized drawing is created in the vector drawing layer. Your bitmap drawing remains intact.